Celtic crosses have been around since the early Medieval period. Some say they were a Christian attempt to woo pagans by adopting the pagan sun symbol onto the Christian cross. Others, that the circle was simply an architectural addition to strengthen the arms of the cross. Whatever the origin, Celtic crosses have unarguable beauty. 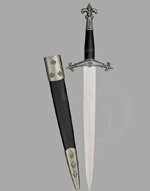 The pommel of this decorative dagger features a stylized version of one of these crosses, and the guard is etched with Celtic scroll work. 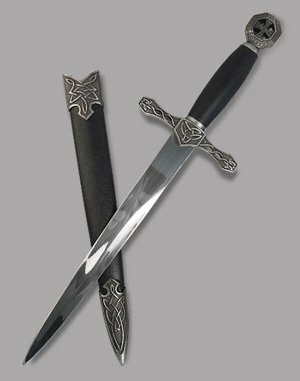 The blade is stainless steel, and features no fuller, making it perfect for engraving your own message. 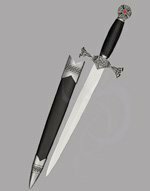 The Celtic Cross Dagger comes with a richly decorated sheath and an enormous heap of elegance. Looking for a good groomsman gift or award? 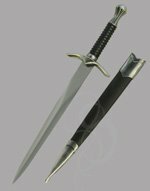 Then look no further than this elegant, classy Celtic dagger. 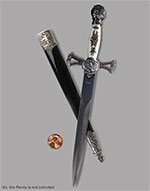 I got some other daggers for my groomsmen but these has a regal elegance that are perfect for Fathers. Paired with an inscription it's cost effective and beautiful.